I've never had Lily-of-the-Valley (Convallaria majalis) in a garden of mine before. Somehow I associated it (and Sandalwood) with 1970s talcum powders - and didn't really think of it as a real plant. It certainly loves the semi-shadiness of the small square of garden under the ash tree beside our front path. It's becoming a bit of a thug there, to be honest, but I love the contrast of the white and green, so I don't see myself doing much about it. 1970's talcum powder - and those gritty, scratchy bath cubes that never completely dissolved in the bath. Christmas presents from aunts. Either that or embroidered hankies. How I longed for a book token. My children look at me in total disbelief when I tell them about Christmas past. 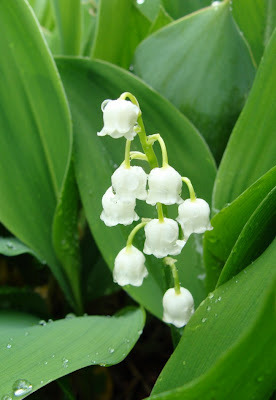 I love Lilly of the Valley and am cross because, when I tried to grow it here, slugs ate it more or less straight away. And . . . I know it's a bit naff but, although I didn't like talcum powder, I used to love the little, gritty bath cubes. I think they made me feel 'grown up'. Here comes the main news - my first sweet corn shoot has come up! Such are the excitements of my enormously action filled life (saving people from disasters, scaling mountain peaks, ski-ing across distant deserts, that kind of thing) this new breakthrough is worth communicating across the continents - my first sweet corn shoot has come up! If I'm honest, I think I was quite pleased to get them at the time, too. Wouldn't be very delighted to get some now, though. That's great about the sweet corn. Definitely news worth sharing. I've just risked feeding the rabbits by directly sowing my third wave of sweet corn into the same bed as the more pampered indoor-grown first and second batch. I hope your slugs don't decide that the corn is as tasty as the lily of the valley! I remember those bath cubes too - forever associated with Christmas. How hard they were. The instructions said crumble them but that was never going to happen with the ones I got - hard as diamonds they were! Ah, those bath cubes, I also remember them well. How funny! :):) Gorgeous blooms.